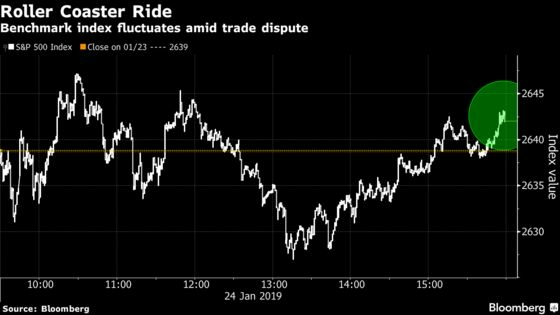 (Bloomberg) -- Stocks closed mostly higher as a rally in semiconductor shares helped temper concern the U.S. and China may be further from a trade resolution than investors had hoped. Treasury bonds remained a refuge and the dollar resumed its rally. The S&P 500 and Dow Jones Industrial indexes swung between gains and losses most of the day after Secretary of Commerce Wilbur Ross said the world’s two biggest economies remain “miles and miles” apart on trade. White House economic adviser Lawrence Kudlow later said President Donald Trump is optimistic about trade talks and the January jobs report will be up a significant amount. The Philadelphia semiconductor index climbed 5.7 percent, the best day since Dec. 26 after strong earnings results from a trio of companies. Twenty-nine of the 30 index members traded higher, led by a 17 percent surge in Xilinx. U.S. airlines also rallied as American and Southwest predicted strong revenue gains after surpassing Wall Street’s profit estimates late last year. After the close, Intel shares fell when the company reported revenue for the fourth quarter that missed the lowest analyst estimate. It’s been a rocky week for investors, as they scramble for clues on both the global trade outlook and the health of the U.S. economy. Looming over everything is America’s partial government shutdown, which not only threatens to crimp activity but is also restricting the flow of economic data. The Senate blocked two rival proposals Thursday to reopen U.S. government agencies in largely partisan votes. Elsewhere, the euro weakened as regional economic data fell short of forecasts, then showed little reaction to a widely expected European Central Bank rate hold. Europe’s shared currency later slumped as report circulated that the the German government cut its growth forecast. Venezuela bonds extended their rally on speculation President Nicolas Maduro’s opponents will gain momentum in their efforts to oust him. The S&P 500 Index rose 0.1 percent to 2,642.33 as of 4:09 p.m. New York time, while Nasdaq Composite Index gained 0.7 percent and the Dow Jones Industrial Average dropped 0.1 percent. The Stoxx Europe 600 Index rose 0.2 percent. The U.K.’s FTSE 100 Index dipped 0.4 percent. Germany’s DAX Index rose 0.5 percent. The Bloomberg Dollar Spot Index rose 0.3 percent, the seventh increase in eight days. The euro slumped 0.6 percent to $1.1309. The British pound fell 0.1 percent to $1.3058, the first drop in four days. The Japanese yen rose less than 0.1 percent to 109.56 per dollar. The yield on 10-year Treasuries fell three basis points to 2.71 percent. Germany’s 10-year yield fell five basis points to 0.18 percent, the fourth straight decline. Britain’s 10-year yield fell six basis points to 1.27 percent. West Texas Intermediate rose 1.2 percent to $53.24 a barrel. Gold fell 0.2 percent to $1,281 an ounce.